Graphite shafts can help increase your swing speed. 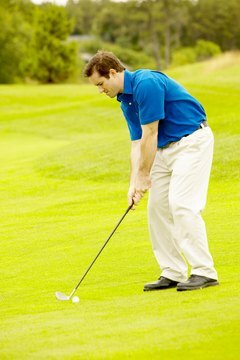 A common mistake made by amateur golfers is choosing golf clubs that are not suited to their swing speed. If you do not match your clubs to your abilities to swing them, it can have an adverse effect on your game. Club factors that should be adjusted based on how fast you swing a club include the shaft flex, torque and the type of shaft. By taking the time to find the right clubs for your game, you can best leverage your golf equipment to improve your game. Determine your swing speed. Many golf retail stores and pro shops can take this measurement. Otherwise, the speed can be estimated based on the club that you hit from a distance of 150 yards. If you use a 3-iron or wood, your swing speed is probably less than 60 mph; a 4-iron is 60-75 mph; a 5-iron is 75-84 mph; a 6- or 7-iron is 84-93 mph; and an 8- or 9-iron is over 93 mph. Determine the shaft flex of your clubs based on your swing speed. The shaft flex is representative of how much force is required for the shaft to transfer energy to the golf ball during your swing. Ladies flex should be used for a swing speed of less than 60 mph, senior flex for 60-75 mph, regular flex for 75-84 mph, stiff flex for 84-93 mph, and extra-stiff flex for speeds above 93 mph. Choosing the wrong shaft flex can lead to hooked, sliced or generally inaccurate shots. Pick a material for the shafts of your irons. The two most common options are graphite and steel. Players with a slow swing speed normally will choose a graphite shaft to maximize the distance the ball travels, while those with a fast swing will choose steel for greater consistency. If your swing speed is moderate, test clubs of each type to determine which feels the best. The majority of modern fairway woods and drivers are sold with graphite shafts and should be chosen based on the information provided in Step 2. Choose the clubhead for your irons. Low-handicap players will prefer half-cavity or blade clubheads for greater consistency and control, while high-handicap players should opt for full-cavity clubs to aid in getting the ball in the air consistently. A half- or full-cavity golf clubhead has a hollowed-out area toward the back to distribute weight around the clubhead, creating a larger "sweet spot." Blade clubheads have more weight around the face of the club. Test the clubs you have chosen before purchasing them. If you do not like the feel of the clubs, pick a different manufacturer with the same configuration options before changing the shaft flex, material or clubhead variant.